Image from NWS Jackson, MS. 9:45 p.m. base reflectivity (left) and storm relative velocity (right) over Atalla County, MS while storm was producing EF3 damage. 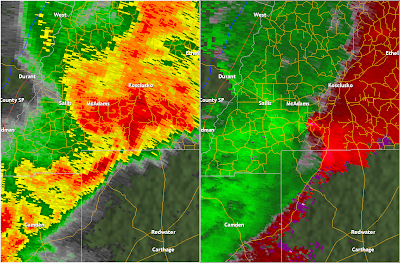 On Monday November 29 and Tuesday November 30, 2010, the Deep South was raked with numerous tornadoes. Survey crews from National Weather Service offices have been out all week surveying the damage. Although most survey activity is complete, there may be a few more tornadoes confirmed before all is said and done. As of Friday morning December 3, 15 tornadoes have been confirmed in Mississippi and 5 have been confirmed in Alabama. Here is a list of those confirmed thus far. Fortunately there were no injuries or fatalities associated with any of these tornadoes. Read more detailed descriptions of survey data at this link from the NWS Birmingham. More can be read about the Mississippi tornadoes here and here.